If negative emotions from past events are shaping your life and your decisions, you can change all of that by using Time Line Therapy to find the Root Cause, and neutralize it. Time Line Therapy™ can change how you react to the past. Do events from the past run your present life? 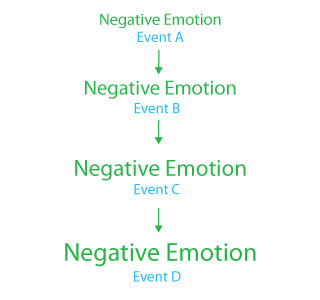 Are you being driven by your stuck negative emotions? You can change that using Time Line Therapy™. TLT is successful online as well. Anger, fear, sadness, hurt, guilt and shame…..get rid of them! In person or online with e-therapy. Resolve negative emotions from past events that shape how you behave today. Emotions are natural and human, but the negative ones shouldn’t last forever! You can find a way to feel emotions appropriately and relative to events that happen now. Throughout our history, humans have been aware of the passage of time. Even Aristotle mentions the "stream of time" in his writings. Everyone is capable of imagining their own "Time Line", a line of time where we store all of our memories. This linear representation is how we unconsciously know the difference between a memory from the past and an imagining of the future, or an experience of now. Time Line Therapy™ uses this linear representation of time as the basis for a process which clears away negative emotions, limiting beliefs and un-useful decisions made in the past. It was created by Tad James, an NLP Master and Trainer, and is a very specific process, to use it one must be trained and use it exactly as proscribed. This is because something that is bothering us now often reminds us of other similar instances in the past. The Unconscious Mind, where all of our memories, learning, beliefs, attitudes, and values are stored, tends to connect similar events into groups called ‘gestalts’. So when you overreact emotionally to a situation, you are really reacting to a collection of similar memories and the emotion becomes distorted by being about many memories or events at the same time, and not just about what is taking place in the current moment. 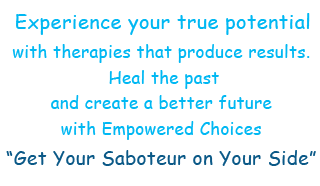 Time Line Therapy™ traces these memories back to their roots and clears away the negative emotional charge, along with any limiting decisions that have been built around the resulting negative belief. The process separates each event in the collection of memories into a stand-alone event, which can then become neutral. At the same time, because of the structure of the line of time in our thought processes, the positive changes we make in the past accelerate forward into the future. Then any future events which would have been part of that collection of memories connected to these negative emotions, become separate, stand-alone events, with the emotion being appropriate in the moment. There are six negative emotions: anger, fear, sadness, hurt, guilt and shame. Guilt and shame are man-made emotions, and they are after-the-fact emotions that arise from our judgments about the event we experienced. Guilt and shame were created in the attempt to get people to do what others wanted them to do, so we can just clear those up since they are unnecessary and we don’t need them. The other four emotions are pure emotions, and they are only negative when they are stored in the body. Anger is how we know our boundaries have been crossed, fear stimulates our fight-or-flight response, and sadness and hurt are how humans experience loss and grief. So when we clear these four emotions, we are only clearing them where they have become disproportionate to specific events, and where they are stored in the body. By doing this, we also generate appropriate emotional responses into the future. So we still experience pure emotions, but we just experience them proportionately to current events and we learn to express them appropriately, rather than suppress them. None of these beliefs are actually true. We only perceive them as true and when we believe them, we are creating a self-fulfilling – and self-limiting - outcome for ourselves. When we eliminate these beliefs or decisions, we have much more freedom to make positive choices for ourselves. I have had great success using Time Line Therapy™ to help clients resolve issues such as eating disorders, unwanted habits, phobias, repeated unsuccessful choices, relationship troubles, anger, fear, and many other limiting emotions, while improving communication, enriching relationships and enhancing performance in all areas of life.